Moscow had a small, mostly transient Jewish presence from the late 17th century onwards. Jewish merchants were required to stay in the Glebovskoe Podvorye, an inn in the Zarayadye quarter, and could only remain in the city for a limited period of time. In 1827, the new military conscription policy, which for the first time included Jews in the Tsar's draft, had the unintended effect of creating Moscow's first permanent Jewish community. Jewish soldiers, garrisoned there for a 25-year term of service, settled down with their families, established houses of worship named after their regiments and founded their own cemetery. Theirs was a small community; in 1848 it numbered only 313 persons. 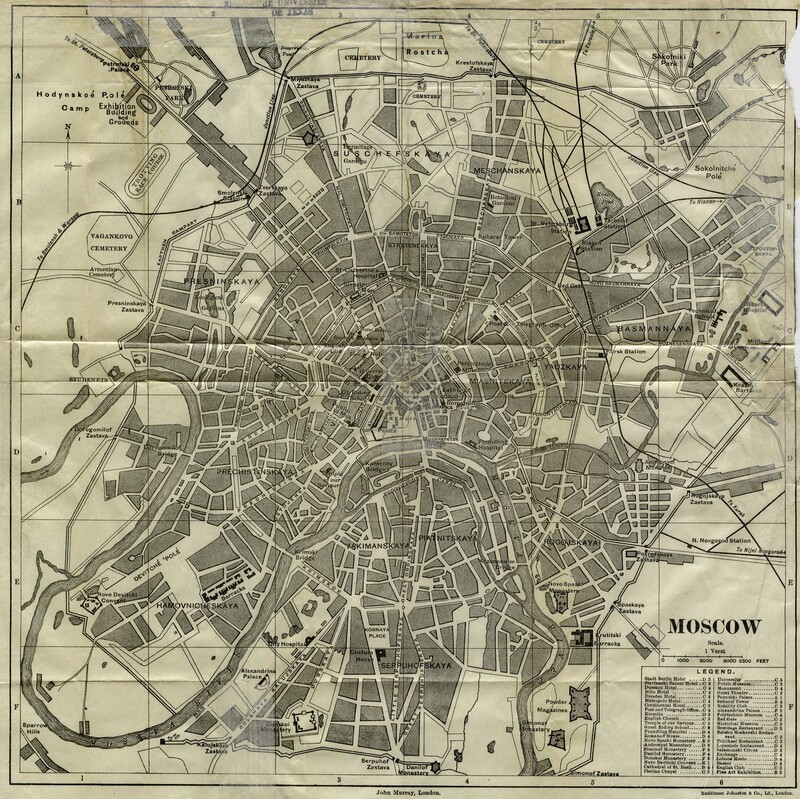 Jewish Moscow expanded and flourished during two subsequent periods: first, in the latter half of the 19th century, especially during the reign of Tsar Alexander II (1855 - 1881) when an estimated 40,000 Jews called the city home, and second, from the Russian Revolution of 1917 until the mid-1930s, by which time about a quarter of a million Jews lived in Moscow. The Zarayadye and Marina Rostcha neighborhoods had a predominantly Jewish population. Many residents were evacuated in 1941 when German troops attempted (unsuccessfully) to take the capital; most returned at the end of WWII. By 1970, there were again around 250,000 Jews living in Moscow; while those numbers fell due to Jewish emigration from the former Soviet Union in the last decades of the 20th century, internal migration from the eastern provinces of the former Empire continues to keep the community's population relatively high: 53,145 citizens identified themselves as Jewish on the 2010 census. Praisman, Leonid. "Moscow" YIVO Encyclopedia of Jews in Eastern Europe 3 September 2010. 15 May 2012. Ro'i, Yaakov "Russia: Russian Federation" The YIVO Encyclopedia of Jews in Eastern Europe. For additional historic details and specific information about the military community, see "Moscow" in The Jewish Encyclopedia of 1906, online. Map by John Murray, 1893 (Public Domain) Courtesy of the University of Texas Libraries, The University of Texas at Austin. Perry Castaneda Map Collection. Many thousands of Jews applied for permission to live in the Russian interior when residence laws were relaxed during the reign of Tsar Alexander II. Historian Benjamin Nathans, in a new study of Jewish life "Beyond the Pale," provides a rough estimate of the size of this movement: in the year 1858, only 11,980 Jews (mostly soldiers), lived in the Russian heartland; in 1880, 59,779 were counted; by 1897 there were 314,000 Jews living legally outside the Pale of Settlement (2002). Access to the desirable cities of Moscow and St. Petersburg was strictly limited. Beginning in 1859, Jewish merchants of the First Guild could request residence permits for themselves, their families, employees and servants; in 1861, permanent residence became possible for scholars with advanced degrees and currently-enrolled students; in 1865, guild-registered, "useful' artisans were also given the right to live outside the Pale, and many came to Moscow. The Jewish population of the city increased over the next decades to 8,000 in 1871, 16,000 in 1880 and about 40,000 in 1890. The flourishing community built synagogues, schools and charities, many located in the Zarayadye quarter on the Moskva River, between the red brick fortifications of the Kremlin and the gleaming white walls of the Foundling Hospital. Another important reform was the Educational Decree of 1861, which for the first time gave Jewish graduates the same rights of employment as gentiles. This motivated legions of young Jewish men and women to pursue higher education: by 1886, 10% of Moscow University's student body was Jewish. Sadly, this era of opportunity came to an end with the assassination of Alexander II in 1881 (for which Jewish radicals were blamed); during the next decade his successor Alexander III gave tacit support to brutal pogroms, restricted Jewish enrollment in schools and universities, banned Jews from living in rural areas and eventually expelled Jewish residents from the major cities of the Russian heartland. Nathans, Benjamin (2002). Beyond the Pale: The Jewish Encounter with Late Imperial Russia University of California Press. Nathans' fascinating work draws on recently released Russian archives; he devotes particular attention to the Jewish community of St. Petersburg, as well as to Jewish participation in higher education and the legal profession in the latter half of the 19th century. Moskva River, 1881. Postcard courtesy of Wikimedia Commons. On the first day of Passover in March 1891 an imperial order suddenly revoked residence permits for all Jewish artisans living in the city, compelling them to return to the Pale. The Tsar's brother had been newly appointed to govern Moscow and he was determined to rid the city of its Jewish population. An estimated 20,000 Jews were forced out of Moscow during the next year and the policy was extended to other cities in the Russian interior, with an additional 2,000 Jews deported from St. Petersburg alone. While merchants, factory owners and academics were mostly able to maintain their homes, other families were expelled under circumstances so harsh, and the number of refugees was so large, that their stories received wide attention in international diplomatic circles and the press. Russia to the German port of Hamburg. The "New Exodus," as the New York Times called it, began in June of 1891. During that summer, between two and three thousand families per week received help from the Hamburg Jewish community. In July, volunteers served 14,128 meals to Jewish families waiting at the port; 23,579 were served in August. According to Frederic, the numbers peaked on 4 August, when 1,360 refugees were fed in one day. Of particular interest to family researchers is Frederic's list of 88 persons evicted from Moscow in 1891, naming their towns of origin in the Pale (1892, pp.291-292). Harold Frederic's original dispatches are reprinted in the New York Times archive. See, for example "AN INDICTMENT OF RUSSIA" by (London Correspondent) Harold Frederic, The New York Times, 7 December 1891, p. 1. Frederic's book, The New Exodus: A Study of Israel in Russia (1892) is available in digital form (free of charge) through The Internet Archive. Map Showing the Percentage of Jews in the Pale of Settlement and Congress Poland from The Jewish Encyclopedia, 1905. In public domain, via Wikimedia Commons from Wikimedia Commons. Map of European Railroad Routes and Stations, with inset showing Moscow-St. Petersburg line. Courtesy of David Rumsey Historic Map Collection. Moscow's Jewish community grew afresh when hostilities along Russia's western border at the start of WWI drove refugees from the Pale into the cities of the Russian interior in 1914. The Tsarist government, desperately trying to organize men and material, tended to turn a blind eye to violations of residence restrictions. KGB; the center of power was Moscow, which in 1918 was made capital of the new Soviet government. In the 1920s and 30s, the state promoted Yiddish-language arts and literature in an effort to influence its Jewish citizens. This resulted in a brief, rich cultural flourish exemplified by the famed Moscow State Yiddish Theatre, whose inaugural production (1921) was a staging of Sholem Aleichem's stories with sets by Marc Chagall. During these decades, according to Benjamin Nathans, "Jews were a much-noted presence across virtually the entire white-collar sector of Soviet society, as journalists, physicians, scientists, academics, writers, engineers, economists... entertainers and more." (Nathans, 2004, p.2). Stalin's purges, beginning in 1936, affected a disproportionate number of Jews. Their leadership in Communist Party, military, secret service and government posts turned Jews, in particular, into highly visible targets for Stalin's paranoia. Unknown numbers were executed and buried in secrecy, although a few high-ranking Jewish members of the regime, such as the Three-Star KGB General Alexander Orlov (born Leiba Lazarevich Feldbin in Bobruisk), managed to escape and tell their stories. Nathans, Benjamin (2004) Beyond the Pale: The Jewish Encounter with Late Imperial Russia. Berkeley: University of California Press. Gazur, Edward (2002) Alexander Orlov: The FBI's KGB General. New York: Carrol and Graf Publishers. 1917 election poster for the Socialist Revolutionaries Party submitted by user Kristallstadt on en.wikipedia. The Jewish population of Moscow was still large at the start of WWII. In 1939, the Census identified 250,000 residents as Jewish. Under the terms of the 1938 Nazi-Soviet Non-Aggression Pact, Russia was assumed to be free of Hitler's attentions. The situation changed suddenly on 22 June 1941 when the Wehrmacht attacked Stalin's forces and columns of Nazi tanks entered the Russian interior at unprecedented speed. Moscow was caught unprepared. Stories are told of children who had been sent to a countryside shtetl for summer vacation and were trapped by the rapidly advancing German troops. November 1941, civilians digging ditches in defense of Moscow. Photo from U.S. Information Agency. The Battle of Moscow began with aerial bombing on 22 July 1941. The capital's newly completed subway system sheltered the population from air attack, while women and older men were pressed into service to dig ditches as anti-tank barriers. Many thousands of residents fled that fall, evacuating eastwards. The German army was within 80 miles of Moscow when, on 19 October, Stalin declared the city to be in a state of siege. By 15 November, the Germans were only 27 miles away, and soldiers claimed to have the towers of the Kremlin in their sights. However, the Russian winter began in earnest in November, and severe supply problems, including shortages of clothing and food, weakened the German forces; a strong counter-offensive by Russian troops in January 1942 drove the battlefront back 120 miles, and for the remainder of the war, German forces never again approached Moscow. Davies, Norman (1996). Europe: A History. Oxford: Oxford University Press. Backlash was a parallel theme. The long course of Jewish history in Russia shows a repeated pattern of government reform leading to Jewish achievement and integration, followed by anti-Semitism and state-sponsored reaction. This was again the case in Cold War Russia, when Stalinist persecution resumed in 1948. Over the next two decades, discrimination and increasingly restricted educational and economic opportunity contributed to a major Jewish emigration movement that began in 1967 and peaked after 1988 with the collapse of Communism. Until 1977, Israel was the destination of the majority of those who left the U.S.S.R. After the late 1970s, more than half of the emigrants chose to settle in the United States or other Western countries. Map of Central Moscow. Published by the U.S. Central Intelligence Agency 1980. Shows house numbering system, includes a place index on a separate page. Courtesy of the Library of Congress.